Scrolling through your music collection to find the perfect tunes to fit your mood can be a bit of a drag – luckily, this is the future and we can take care of minor annoyances with technology. Mico is a set of headphones from Neurowear that can read your thoughts and select music that matches your current mood. 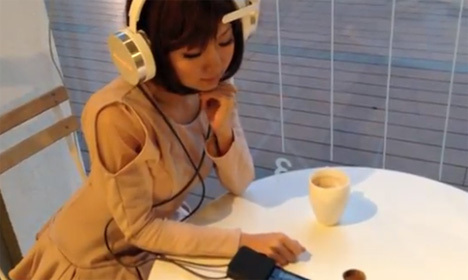 The headphones have a small band that extends across the forehead to measure brainwaves. The associated app reads those brainwaves, determining your state of mind. It then picks out a song that’s compatible with the way you’re feeling. The downside? The headphones currently only work with the app’s built-in library of 100 songs. But the Mico setup is only a prototype at the moment, so Neurowear has plenty of time to refine the technology. We want to put these babies on and have them give us the perfect song for every moment of the day. See more in Audio & TV or under Gadgets. March, 2013.